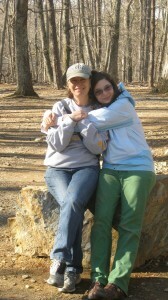 Rachel Seidman tells her daughter Hazel about her favorite childhood place in nature. RS: So I spent a lot of my time outdoors by myself, or sometimes with my brother but mostly by myself. There’s a creek that runs by the house. My mom would let us just go out and play by ourselves in the woods for as long as we wanted because she knew that we could just follow the creek back and we wouldn’t get lost. But there was a place out there that we called “the secret place” that was just a sort of opening in the woods where the trees were less dense. And I remember my mom used to pack a picnic and we would tromp out there. It was probably only two or three hundred yards from the house; it wasn’t like it was very far away. But it was this, you know, really sort of magical little spot out in the woods, and my mom and my brother and I would go out there and have a little picnic. HF: I’ve never been there. RS: I don’t know that it still exists in the way that it used to because they’ve cleared the woods so much. My dad built a tree house near the house and I used to gather leaves and berries and pinecones and acorns and stuff and “cook” meals in the tree house a lot. I was very proud of myself because I could tell the difference between, like, wintergreen berries and poisonous berries. You know I did a lot of—there’s a certain kind of moss that people said had a sort of anti-bacterial quality to it that you were supposed to put it on cuts if you got a cut. HF: Something you’ve never taught me and my sister. RS: Well you don’t clomp around in the woods! HF: My sister eats everything. RS: Yeah, your sister’s not so good about being careful of which berries are poisonous. HF: Like we’ll be walking around town and she’ll just be like, “Oh, berries I’ll eat them!” Not the smartest soul. RS: So yeah, I had a very intimate relationship with woods and nature when I was growing up, which is something that my kids, because they’ve grown up in much more urban areas, don’t really have, I would say. And so, you know, that’s something that I regret on their behalf because they’re not so comfortable walking around in the woods.